With the new Fastpass system and viewing arrangements for Fantasmic in Disneyland, there are a lot of things to take in. If you don’t get to Big Thunder Ranch at park opening and beat the crowds to get Fastpasses for free, you’ve got two options – stand by with the crowd in the back or get a dining package with preferred seating. If you’ve got the funds, I’d say go for the dining package! There is the most expensive option : Blue Bayou, and there is the least expensive option : Aladdin’s Oasis. Why don’t we meet in the middle and try River Belle Terrace instead – which will be the topic of this article. All options provide delicious food and preferred seating, but the River Belle Terrace option combines a reasonable price with better than average seats for the show which makes it the perfect choice for your dining package! The River Belle Terrace package is around $40 per adult and $20 per child (3 to 9) as opposed to the whopping $60 for Blue Bayou. 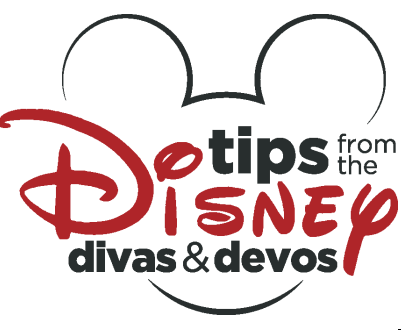 In this package you receive a 3 course meal and a Fastpass in the preferred seating area – closest to the water. It is helpful to make reservations before hand, they fill up fast! That way you will be able to get the first available seating and tickets. 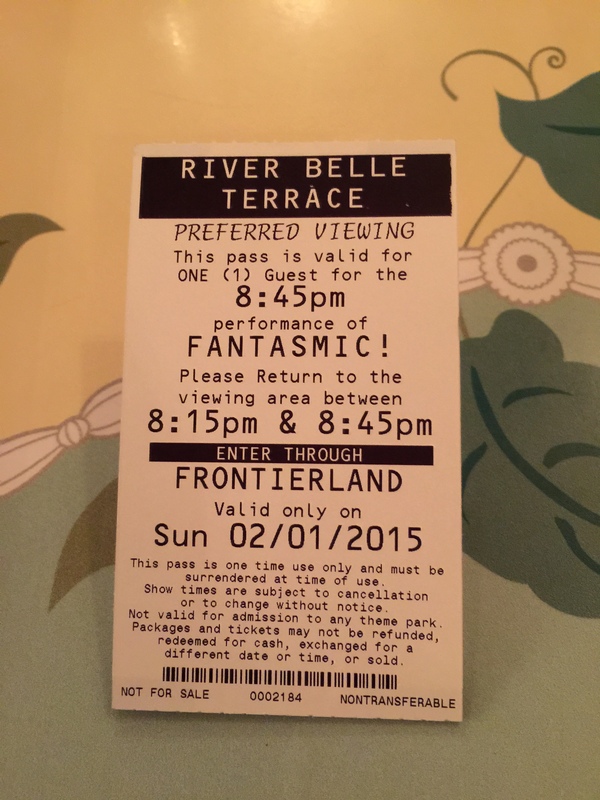 You can start arriving for your meal at 3 PM and on until the latest showing of Fantasmic. (making a reservation early gives you the opportunity to choose a time more convenient to your schedule) The ambiance of the Terrace is old fashioned with bright and flowery details. As you walk up, a table will already be set for you with a waitress or waiter happily awaiting your arrival. There is seating inside and outside the Terrace at your convenience. Once you’re seated, you are given complimentary rolls and butter as you look over your menu choices. 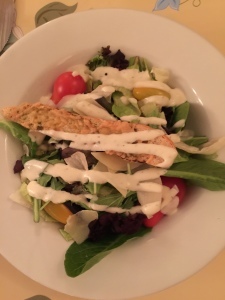 As an appetizer you have a choice of a fresh and colorful greens salad or sweet corn chowder. Either choice is a tasty start to your dinner. Main dish options include a slow-roasted New York strip and Cajun shrimp skewer served with fresh veggies and mashed potatoes, rosemary marinated chicken breast also served with mashed potatoes and vegetables, and hand tossed cavatappi pasta primavera with crisp green beans and bell peppers in a garlic cream sauce. All options have their merit. The steak melts in your mouth and the mashed potatoes are so heavenly I could have it as a main dish all by itself! 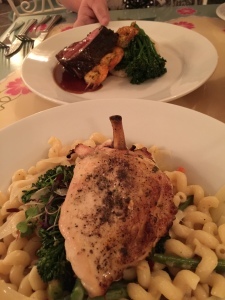 If you ask nicely or if you are celebrating something special, you can ask to have chicken served with your pasta to round out your meal. This food will fill your stomach with pure bliss – but leave room for dessert! There are two dessert options available – but only one is worth getting. If you like chocolate, feel free to try the chocolate mousse cake with raspberry sauce (slightly gritty but overall not too bad). However, if you are ready to send your taste buds to their happy place, order the caramel apple pie with streusel! 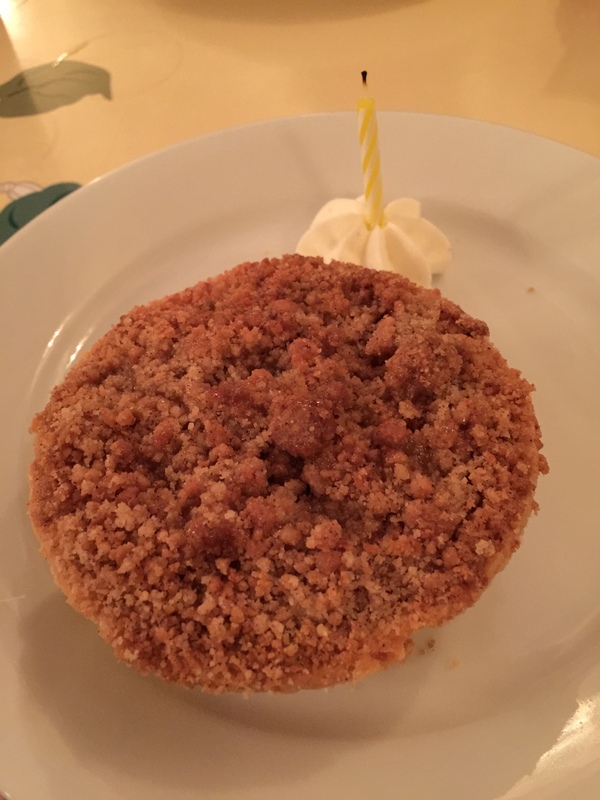 This cinnamony crusted pie warms not only your mouth but your heart – and might just be the best thing on the menu! Be sure to ask your server to warm your pie up before you eat it. This just makes the ooey gooey apples even more yummy. Overall, these fine dining series of menu options give you a fancy feast that fills you up quickly and might just put you in a food coma (and that might be a good thing!). Everything proved to be extremely tasty and served in large portions – well worth the money! At the end of your meal, your server will provide you with your Fastpass tickets – allowing you into the reserved seating area. This area is seating only and closest to the water right up against the railing of the Rivers of America. 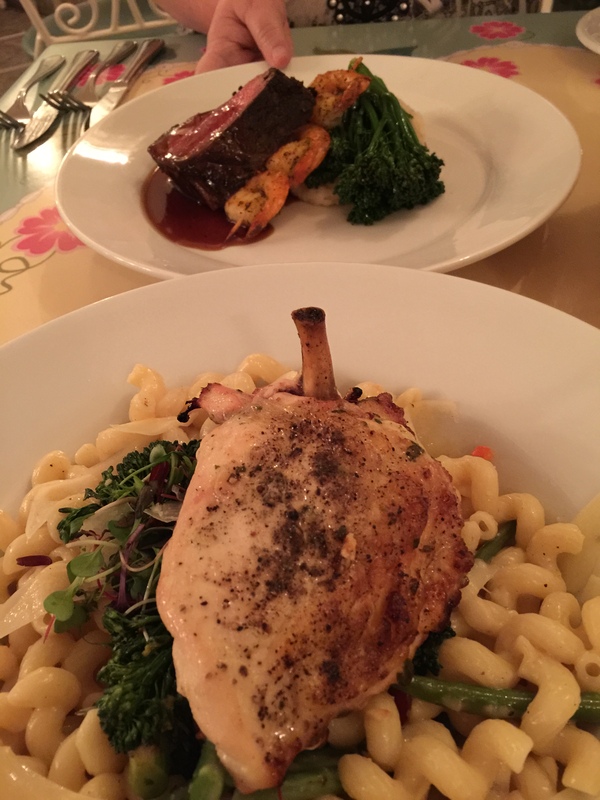 It is shared with those who dined at the Blue Bayou. Same area for both, but the River Belle Terrace experience is less expensive of a meal than Blue Bayou and gives you amazing seats without emptying your wallet. 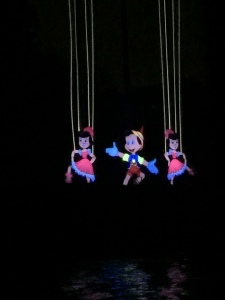 Be sure to get to your seating area at the time suggested or up to 15 minutes prior to the show. If you get there earlier, cast members will turn you away and make you come back later. Since this area is seating only and has brick floors, make sure to bring a blanket or a seat cushion to provide you comfort. 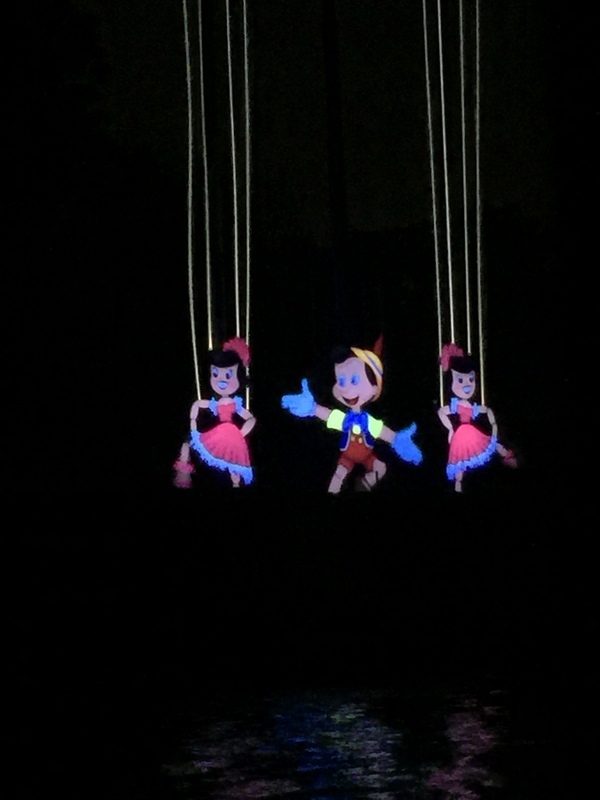 You are sure to be amazed not only by your seats, but by the show as well. 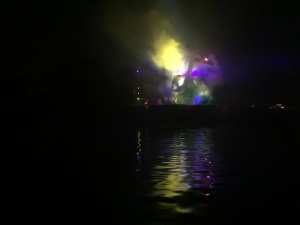 Mickey lights up the sky with a combination of mist screens (like World of Color), fireworks, neon lighting, and pyrotechnics for a dramatic battle with the forces of evil. Who will win? (you’ll have to watch to find out!) I give this show a 9 out of 10 because it’s story, music, and colorful characters blow audiences away. 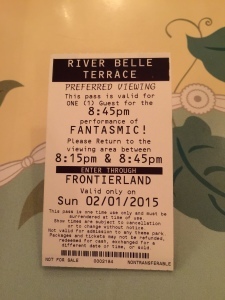 If you plan to see Fantasmic, try to get the best seats in the house with a dining package at River Belle Terrace. You will not be disappointed!